Kuuts makes some fantastic cigars, and the new KuutsConnecticut is proof of this. The cigar looks great and offers an incredible smoke, making it a new addition to the Kuuts line that you might want to try. The Kuuts Connecticut cigar was first released at the 2015 IPCPR. Also launched at this time was the Kuuts Miro Capa Negra cigar, a cigar featuring a Mexican San Andres wrapper. 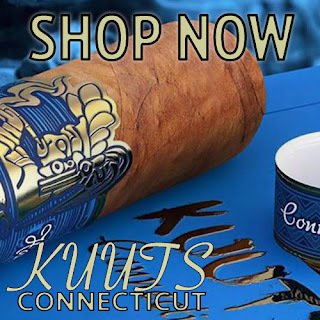 Kuuts Connecticut features an Ecuadorian Connecticut wrapper, as well as a binder from Nicaragua and Nicaraguan, Dominican, and Honduran fillers. Like the Miro Capa Negra, Kuuts Connecticut cigar is made at the Kuuts Compañia Hondureña de Tabacos factory. One of the things that makes Kuuts Connecticut stand out is the wrapper. The cigar has an extremely smooth wrapper and the Taino logo printed on the cigar’s band makes it all the more appealing. Flavor wise, the cigar doesn’t disappoint. It’s complex and light, perfect for just about any occasion. The Kuuts Connecticut cigar comes in boxes of 20 and three vitolas. Buy yours for the best online prices from Cuenca Cigars.